• Low, mat-forming, with flat heads of small white flowers in late summer and autumn. • Darkish green, aromatic, feathery leaves. • A good choice for informal or meadow-style plantings. • ±30cm in flower; Spread: ±40cm. • Composting: Add leaves to the compost heap to speed up decomposition. 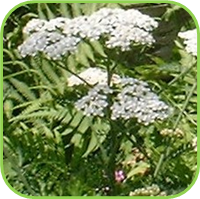 • Infuse and use as a copper fertilizer for other plants. • Helps nearby plants to resist disease and deepens their fragrance and flavour. • Attracting Beneficial insects: Hoverflies, Bumble bees, Butterly, Labybird, Wasp. • Salads, Sandwiches, Potato salad, Soft cheese dips, Garnish. • Infuse fresh leaves and flowers for a facial steam and tonic lotion. • Use the infusion as a basis for a face pack for greasy skin or in a relaxing bath. 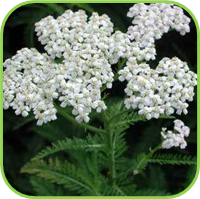 • Use yarrow tincture as aftershave to tone the skin and heal shaving cuts. • Rich in minerals and vitamins. • Stimulant and tonic, especially in feverish conditions with appetite loss. • Anti-inflammatory, Mouthwas for inflamed gums. • Haemorrhage of mucous surfaces, nosebleed. • Topical for chapped skin and rashes, ulcers. 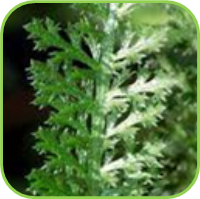 • Astringent and antiseptic: externally it helps in healing of wounds, and stops minor bleeding. Treats cuts that become inflamed. • Eczema - used externally in bath water can be beneficial in some cases. • Temperature reduction in the early stages of Fevers, Influenza, the common cold, Measles, chicken pox and feverish children's complaints. • It has anti-inflammatory actions and helps promote sweating. • Anti-microbial on Respiratory System. • Anticatarrhal: sinusitis, hay fever, and dust allergies. • Treats allergies such as allergic rhinitis. • Internal and external bleeding. • High blood pressure with thrombosis, to prevent blood clots. • Tones the blood vessels, Varicose veins. • To lower an elevated diastolic blood pressure, due to a dilation of the peripheral vessels. • Liver and gall bladder complaints. • Biliary colic, diarrhoea, dysentery, stomach cramps. • Antispasmodics: Nervous dyspepsia, Colic and flatulence, Irritable bowel disease, Gastritis. • Kidney tonic, Anti-microbial on Urinary system. • Urinary antiseptic - cystitis. • Obstructed menstruation, helps regulate menstrual cycle. • Painful menstruation (dysmenorrhoea): spasmolytic action and will help with excessive bleeding. • In the bath to relieve aches and pains. • One to two teaspoonfuls of the dried herb and leave to infuse for 10-15 minutes. • Drink this hot three times per day. • When feverish it should be drunk hourly. • Take 2-4 ml of the tincture three times per day. • Take in moderation and limit continual internal, daily use to a mximum of 2 consecutive weeks. • Do not take during pregnancy. • Overdose may produce headaches and vertigo.